Deer Run Ranch is only ten minutes from Carson City and twenty-five minutes from Reno. Though secluded, it is not isolated, and there are many things to do and see in the area. There are excellent restaurants in Washoe Valley, Carson City and Reno. OPEN ALL YEAR ROUND ~ Deer Run Ranch Bed & Breakfast located in Carson City, NV is the perfect hideaway for a private, secluded getaway any time of the year. Alfafa fields surround the complex, which has spectacular views of Washoe Lake and the Sierra Nevada mountains to the west. Tall cottonwoods shade the pond deck, a favorite spot for watching the abundant wildlife that call Deer Run home. Our casual, contemporary ranch house combines luxury with the charms and pleasures of a simpler time. 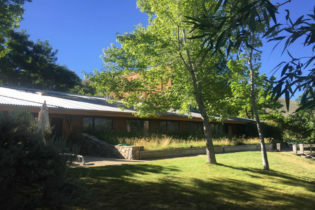 This owner-built passive solar home was designed to be cool in the summer and warm in the winter, reflecting the extremes of climate typical of the high desert mountain west.The private guest wing has two comfortable guest rooms with queen beds and private baths, and guest sitting room with private entry. In these tranquil guest rooms you can sit on the window seats and look out at the Sierras; or you might want to sit by the cozy fireplace in the sitting room, which is decorated with Navajo rugs and paintings, and enjoy the extensive library collection. We have TV satellite, DVD and VCR, coffee and beverage service, and guest refrigerator in the sitting room for your convenience. Free, high-speed internet access is available!